I have a very unique Nikon D7100 – it is likely the first unit converted for infrared use – in the world. My D7100 is also likely the first to undergo two infrared conversions (more on this in a bit). I was fortunate to receive my D7100 from B&H as part of the first wave of product shipments. Apart from a night of putting the DSLR through its paces to ensure that there were no focusing problems or other issues, I didn’t have the D7100 for very long. For the many reasons Nasim outlined in his detailed D7100 review, and being very familiar with its predecessor, the D7000, I liked what I saw of this DSLR’s capabilities. My previous Nikon IR DSLRs, a D40X and D90, sported 720nm IR filters. The 720nm filters have been described as the most versatile of the various IR filters available, since they enable the camera to capture a significant portion of the IR spectrum. 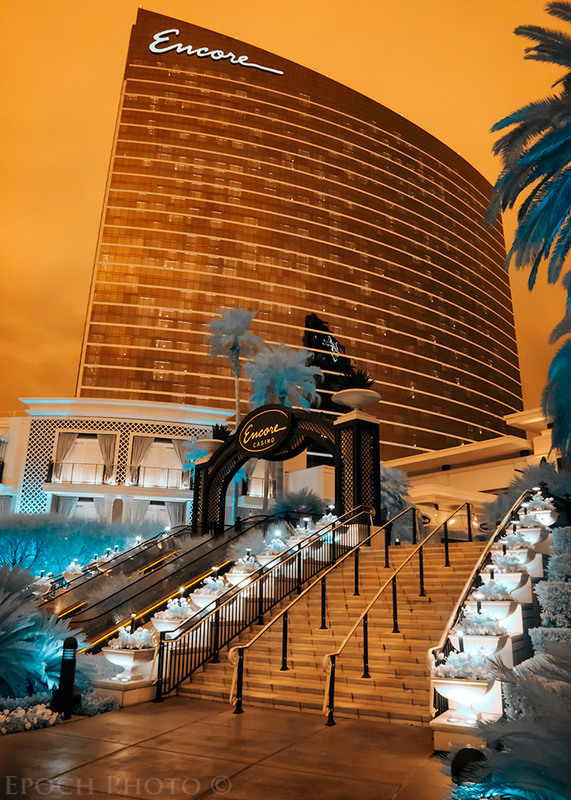 They also allow just enough visible light to reach the sensor and produce some interesting false color effects when using Photoshop’s Channel Manager control. Below is a photo from my D90 and a 720nm IR filter. I had been looking over some stunning false color photos taken with IR filters, such as the 590nm and 665nm filters, that allowed more visible light to reach the sensor. You can think of my musings as, “The IR filter is always more colorful on the other guy’s camera.” After going through some tutorials on one of the conversion company’s website, and speaking with the customer support representative, I was under the impression that the 665nm filter might be the best of all worlds – rich IR capabilities combined with a wider array of false color processing capabilities. I did read of some concerns regarding that the 665nm filter might render vegetation in subtler tones than the 720nm filter, but according to the IR conversion company tutorials, however, it seemed that this could be overcome easily enough using Photoshop’s Lightness slider to lighten the yellows (produced by using the Channel Manager’s ability to swap the Red and Blue channels). In speaking with the IR conversion company representative, he also confirmed that with a bit of Photoshop tweaks, I could achieve similar results as those of the 720nm filter. My mind was made up – I was going to order the 665nm filter. As usual, I sent my main IR lens, a Nikon 16-85mm lens (consistently rated as one of the best IR lenses for Nikon DSLRs), along with the D7100 to enable the company to calibrate the pair. Since IR wave lengths are longer than those of visible light, IR conversion companies sometimes request that you send in your most-used IR lens along with the DSLR, so they can adjust the camera’s focus to that of the lens. 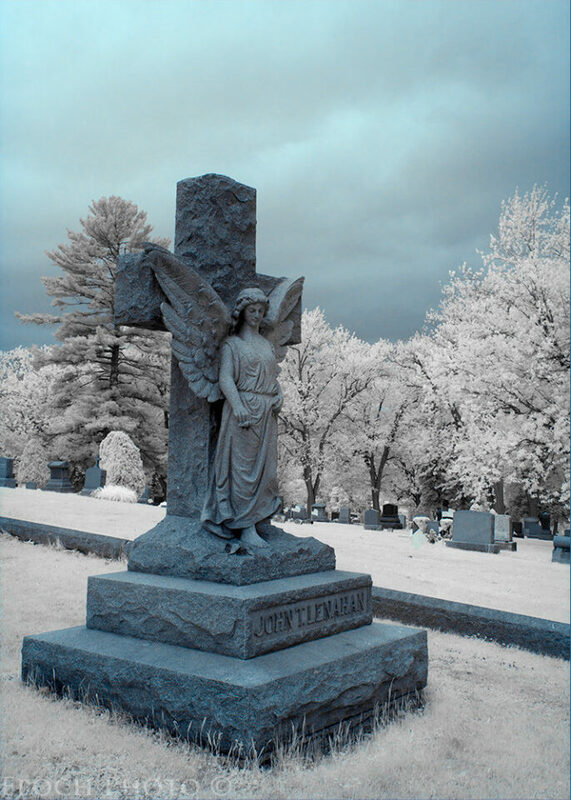 Others modify the focus for an “average” IR adjustment value, but not to that of a specific lens. The adjustments made by the IR conversion companies can extend beyond what you are able to achieve with the AF Fine Tuning capability in most DSLRs. As with visible light, you should always test your lens via a tool such as LensAlign to ensure that you correctly calibrate your lenses to achieve optimum performance. Spring had not yet arrived in Pittsburgh due to the unusual cold spell the area endured during the last few weeks of March. 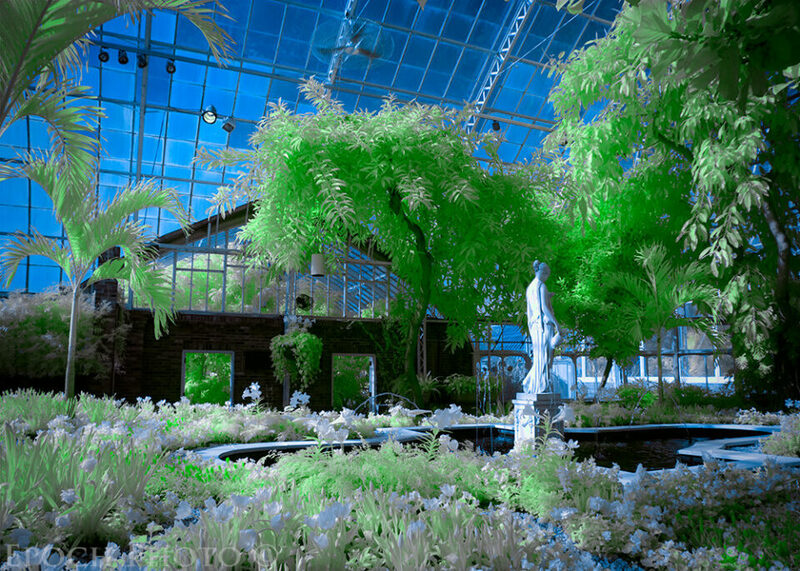 So as soon as I received my D7100, I immediately headed over to Pittsburgh’s Phipps Conservatory, a botanical garden with plenty of luscious green plants, perfect for testing an IR camera. I took along my D90 (with 720nm IR filter) to get some sense for how the two DSLRs stacked up against one another. I spent a few hours walking through Phipps Conservatory putting the D7100/665nm combination through its paces. I shot quite a few photos using the custom white balance as well as Auto White Balance. I then headed off to Las Vegas for a business trip and brought the converted D7100 for a bit more testing. I now had quite a slew of IR photos taken in a variety of lighting conditions (mostly sunny) that I could process. Since the 665nm IR filter allows a higher percentage of visible light to strike the sensor than the 720nm allows, it requires a different post processing routine. I was able to capture some very good (at least to my eye) images with the D7100/665nm combination. At the same time, I noticed that my shots were not quite as “crisp” as those taken with my D90/720nm – this related to sharpness as well as the brightness and contrast of the vegetation, one of best subjects for IR. Despite the claims of being able to whiten the vegetation to achieve similar results to those of the 720nm filter using the sliders found in Photoshop’s Hue/Saturation control, I found this nearly impossible in many circumstances. Under certain conditions, I could get close, but the 665nm sensor invariably produced vegetation that looked a bit gray and flat when compared to that taken with the 720nm filter. I could lighten the yellows a bit, but then found myself blowing out the details in some of the channels. This made for some interesting color IR shots, but if you appreciate the crisp whites and sharp contrast associated with the 720nm or higher IR filters, the 665nm may not be the best choice. Some of the 665nm’s duller vegetation could be improved by converting the image to black and white, but this negates some of the very reasons why you would select the 665nm filter. 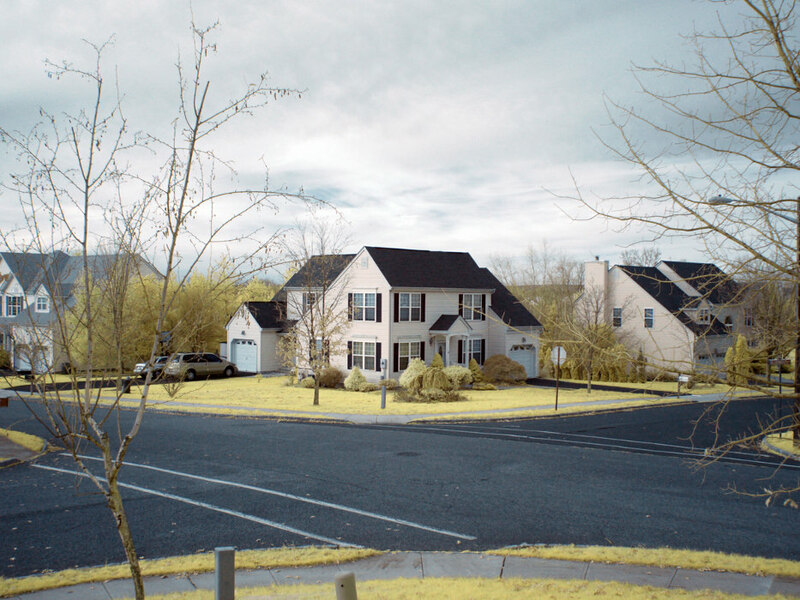 The photo below is a good example of the “muddied” colors the 665nm filter sometimes produced. Since the 665nm filter allows more visible light to reach the sensor, selecting a single focal point for sources of light with very different wavelengths gets a bit tricky. The same concern exists for colors that make up the visible spectrum, since each also has its own wavelength corresponding to a value on the electromagnetic radiation scale (EMR). Most lenses do a pretty good job of making sure that all of the colors of the visible light spectrum get to the same point on the sensor. But if you have ever seen Chromatic Aberration effects (colored halos on the edges of the surfaces of subjects in your photos), however, you have seen what can happen when the various colors of the visible light spectrum don’t focus at the same point on the camera’s sensor. Adding infrared light to the mix only complicates the focusing issues. Even with AF Fine Tuning tweaks, I was not able to get the same sharpness (all things being equal) with my D7100/665nm combination as I was with the D90/720nm pairing. The 720nm IR filter allows a smaller percentage of visible light to strike the sensor and thus doesn’t have the same degree of focus tuning challenges associated with the 665nm or 590nm filters. Was this a “killer issue?” No, but it was noticeable. Of course, after staring at my computer monitor for too long, I began to question my own judgment regarding the results. I asked my wife to look over some photos taken with the 720nm and 665nm IR filters. To my surprise, she was able to accurately identify photos taken with each, based on both their sharpness and their contrast, even after I was able to employ a similar false color processing scheme to them. She also liked the photos taken with the 720nm filter better than those taken with the 665nm filter. With my 720nmIR filter-based DSLRs, I could usually count on the same post processing settings to work for every photo taken within a given set (same time of day, same mix of cloud/sunshine, same lens, etc.). I might have to make some minor adjustments from photo to photo, but I got very consistent results once I fine-tuned a setting for a given batch of photos. I noticed that with the D7100/665nm combination, this wasn’t always true. From the same angle, using the same lens with the same settings, I could get some very different results simply by panning around slightly within the same scene. And while some IR conversion process firms do warn you about more variability with the 665nm and 590nm filters, I was surprised at how much I had to play with post processing settings for images that were taken a second or two apart and simply highlighted a slightly different aspect of the landscape. The increased variability of the D7100/665nm pair was likely due to the fact that, as I changed the angle of the lens or focused on different aspects of the landscape, the mix of IR and visible light varied more than what would have been captured with a 720nm IR filter. Again, this is not a deal-breaker, but the 665nm IR filter’s added variability did cause me to spend much more time processing my IR images than was necessary with my 720nm IR filter-equipped DSLRs. The duller vegetation, reduced sharpness, increased variability between shots, and corresponding increase in post processing time, however, were enough to make me want to switch back to the 720nm filter. This is not to indicate that there is anything inherently wrong with the 665nm filter or the conversion company that installed it. Some of my opinions are tainted by my own personal tastes. I do know others that have sworn by their 665nm filters and produced some excellent results using them on different cameras. But the process of using Photoshop’s Hue/Saturation control to have the 665nm filter mimic the results of the 720nm filter, touted by some conversion companies, isn’t the “magic sauce” they might have you believe – at least not when used on photos taken with the combination of the 665nm IR filter and the D7100. I knew that the D7100 was an excellent DSLR based on Nasim’s and others’ reviews, as well as my own assessment of its feature set. I also knew that I would get quite a bit of use out of my IR-converted D7100 over the next few years. The issue was not the camera, but rather how this specific 665nm filter, made by this manufacturer, behaved with the D7100’s sensor. IR filters are made by a variety of companies, including CDGM, Shott, Hoya, and Kodak/Wratten. And while some filters may have the same IR rating, often measured in nanometers (such as 590nm, 665nm,720nm, and 850nm), the truth is that each filter will vary in terms of its specifications from company to company and produce slightly different results. Add the variability of how different camera sensors deal with IR light and you can easily find that camera A, combined with 720nm filter from company B, produces very different results than camera C, combined with a 720nm filter from company D.
Below are some examples (reprinted from Kolari Vision’s website with permission) of how the same 590 IR filter behaves with different camera/sensor combinations (Nikon D90, Panasonic FH20, and Canon G10). As you can see, the results can vary quite a bit. Other IR filters may not show as much variance as you see in these photos, but you will get different results with various makes/models of cameras using the same IR filter. Combining a healthy mix of both IR and visible light can play havoc with some sensors and lead to some compromises in the camera’s ability to correctly focus both types of light and/or deliver consistent results. The 590nm and 665nm filters simply are not an option for some point and shoot cameras due to the widely fluctuating results. This shouldn’t be too surprising, since the sensors available in most digital cameras are not specifically designed for IR light. The only way to know for certain what you can expect from a given conversion process is to find someone with the same make/model camera and a specific make/model of IR filter, and look over some of their photos. The good news is that you can easily find such a person(s) on one of the many photography forums. And most of the IR conversion companies have some good examples of popular camera models and IR filter choices. So now that I had decided that the 720nm filter was a better fit for my D7100, I decided to bite the bullet and get rid of the 665nm filter. I wasn’t excited about having to spend the money for another conversion, but since I anticipated using this DSLR for quite some time and expanding my infrared photography efforts, I thought it well worth the cost to ensure that I had a filter that met my needs. I decided to investigate some of the other IR conversion companies. I came across Kolari Vision, a family-run business based in NJ. I was very impressed with their website, which I believe has some of the best guidance for those interested in IR camera conversions. I reached out to Ilija, one of the Kolari Vision’s owners. He was extremely responsive and quite interested in understanding the issues I had with the 665nm filter. Ilija was not too surprised to hear of my concerns, since he was well aware of the variability inherent with the 665nm and 590nm filters, and how the results are influenced by the sensors they are paired with. He agreed to do the conversion, even though he suspected it might be a bit more work, since he had to undo an IR conversion previously done by another company. If you are contemplating a conversion, I strongly encourage you to reach out to the companies you are considering and gauge their willingness to entertain and respond to your questions, the thoroughness of their responses, the quality of their website material, and their overall attitude toward customer support. I was extremely impressed with Kolari Vision’s pre-conversion communications. Ilija was always available to answer my questions even on weekends and late night hours. Had I taken the time to speak with Ilija prior to choosing my original 665nm IR filter, I suspect I would have reconsidered this choice and stayed with the 720nm filter. And since filters with the same rating (such as 720nm), from different manufacturers, can produce different results, reach out to others on the net regarding their experiences with different camera models, filters, and conversion companies. This will help you understand whether your particular camera and the IR filter from a given IR conversion company are capable of producing IR results that are satisfying to your eye. 4.1) Custom White Balance – Oops! Ilija quickly converted the camera and shipped it back to me within a week. It turned out to be quite a bit more work than he anticipated. Once I got my D7100 back from Kolari Vision, I was eager to test it out. Unfortunately, spring was not much further along in Pittsburgh, so decided to head back to Phipps Conservatory. Before doing so, I attempted to create a custom white balance setting, something very helpful to have relative to getting consistent IR results. The usual method of setting a custom white balance by “pointing your camera and filling the frame with a patch of grass on a sunny day” didn’t seem to work. I tried it numerous times and verified the steps via the manual, but I couldn’t get it to work. I tried increasing and then decreasing the exposure compensation, blurring the image, and every other trick I am familiar with, all without luck. I tried the same process with my D90/720nm filter and had no problem creating a custom white balance setting. Recalling that the other conversion company had created a custom white balance by pointing the D7100 toward a lamp (I could see it in the custom white balance settings), I tried the same trick. Sure enough, I was able to create custom white balance settings using a halogen light, a regular incandescent bulb, and an infrared flashlight. For some reason that I have yet to determine, the D7100 needs an extraordinarily bright light source in order to focus with its IR filter. I am still doing some investigation as to the reason behind the inability to use the most common method of creating a custom white balance with the D7100. I will provide an update to the article if/when I get a solid explanation. It may simple be that algorithm Nikon uses in the D7100 to determine if the camera has captured a suitable photo for use as a custom white balance setting isn’t compatible with the amount of infrared light reflected by the grass. Since I shoot RAW most of the time, this wasn’t a deal breaker for me. Once I got down to Phipps Conservatory, I was disappointed to see that they had switched the main garden court’s theme. 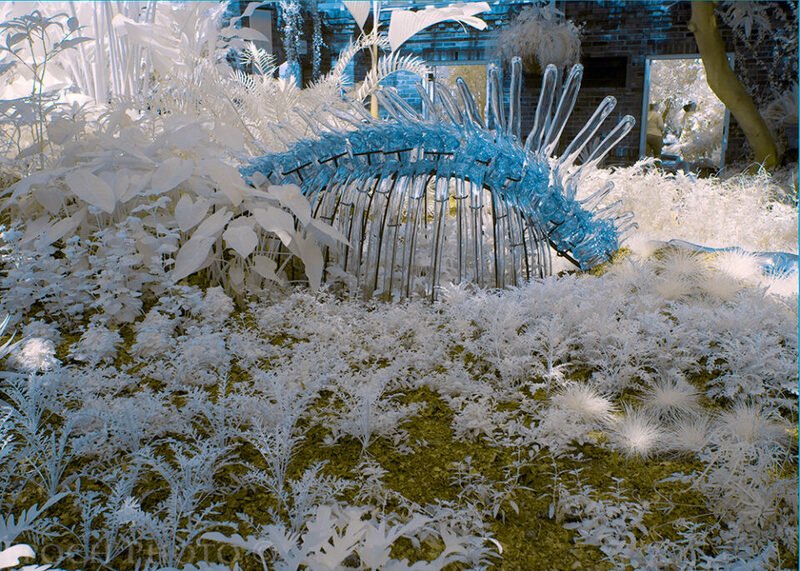 Gone was the “Lady of the Garden” (as I nicknamed her), and in her place, was a set of mastodon bones formed from colored glass. They were appealing in their own way, but certainly not as beautiful as my previous subject. Of course, had I ever contemplated that I would be sending my D7100 back to switch filters and doing so many comparison shots, I would have created a more structured test case! As I previously mentioned, each specific IR filter and camera sensor combination is going to provide somewhat different results from others. I took a good bit of time to experiment with different white balance settings in Lightroom. I found that my old Lightroom settings used with my previous 720nm filters on my D40X and D90, even starting with the custom white balance setting, didn’t seem to work very well with my Kolari Vision 720nm filter on my D7100. The traditional color swapping routine in Photoshop’s Channel Manager needed some tweaks as well. After reading some reports by other IR photographers touting the white balance superiority of Nikon’s Capture NX2, I decided to download a trial copy. While it yielded somewhat different results than Lightroom, I can’t say that the final processed photos from Capture NX2 looked better. After some experimentation, I was able to find a set of white balance settings in Lightroom and a Channel Mixer color swapping action in Photoshop that yielded consistent results for the D7100/720nm filter combination. Note: If you are new to IR photography and/or have recently switched cameras/sensors, be aware that post processing requires a bit of experimentation and patience. It is made more complicated by the fact that any Channel Mixer settings you use are highly influenced by the starting white balance point. Unfortunately, even subtle changes in white balance settings in Lightroom or Adobe Camera RAW (if you are shooting in RAW), which are often difficult to discern on your computer monitor, can cause significant changes once you apply a Channel Mixer action. The D7100’s 24MP sensor provides a significant boost in detail beyond the D7000’s 16MP sensor, and the 12MP sensor DSLRs. As we all know, it is not simply the number of megapixels that determines quality, but rather the quality of those pixels. While I appreciate my D800’s 36MP detail, I have to admit that a quality 24MP sensor is just fine for most purposes. And as Nasim points out, The D7100 handles noise very well. The D7100 is also a great match with the Nikon 16-85mm 3.5-5.6mm VR lens, arguably one of the best and most flexible DX lenses for IR photography. This lens been glued to each of my IR DSLRs since its introduction. If the Nikon 16-85mm VR lens is out of your price range, bear in mind that the humble and cheap Nikon 18-55mm 3.5-5.6 AF-S (VR and non-VR versions) lens produces excellent IR results. 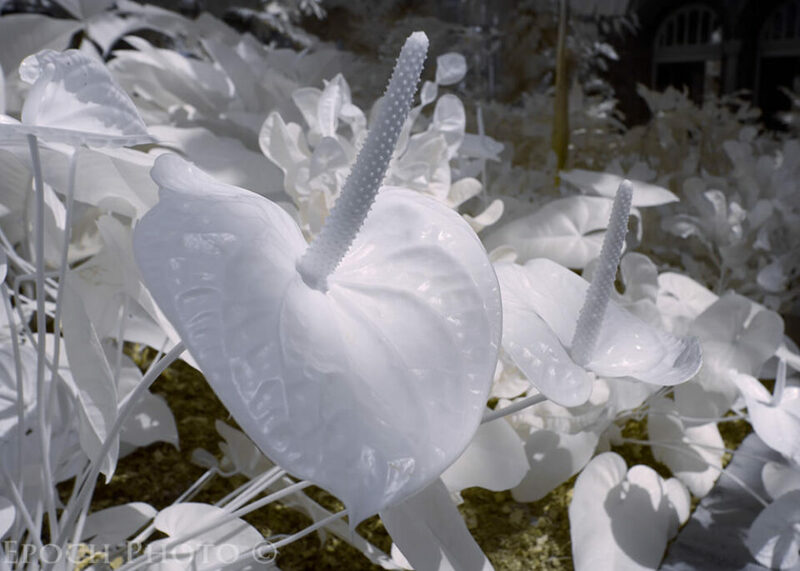 Since many IR shots are also taken at apertures between f/5.6 – f/11 with low ISO values in good lighting conditions, the advantages of FX over DX, relative to low noise at high ISOs and shallow depth of field, are somewhat negated. You may wonder why I recommend the D7100 over the D5200 (also a fine camera and great value), since their sensor performance, as tested by DXO Mark, is very similar. I like the ability to access the D7100’s camera controls via external buttons, rather than having to dig through the D5200’s menu system. Having access to the Exposure Compensation button on the top of the D7100 is quite handy for IR photography, since the DSLRs do not always meter IR light as well as visible light. As such, I often find that I may have to make adjustments via the Exposure Compensation button (usually within +/- 1). In bright sunlight, the menu systems of most cameras such can be a bit tough for me to see, so I appreciate the D7100’s method of handling adjustments via controls more than that of the D5200. And since I have large hands, I also found that the D7100 was a bit easier to handle than the diminutive D5200. In light of these considerations, and the D7100’s sticker price of ~$1,200 (US dollars), I believe the D7100 is an ideal IR DSLR. And I couldn’t be more pleased with Kolari Vision’s IR conversion and customer service. For Nikon shooters, the D7100 is a great IR camera at a very affordable price. Its 24MP sensor does an excellent job relative to detail, noise, and managing IR light. The D5200 also represents a solid bargain if you are willing to live with a few trade-offs. Before deciding on an infrared filter, make sure you do your homework and determine how well each filter (from a specific manufacturer) works on your specific camera model. In my case, I realized I was taking a bit of a chance, since I was the first to have a D7100 converted to the 665nm IR filter. Don’t decide on an IR camera conversion using a filter until you have had the opportunity to see a few examples of photos processed with it. This is especially true if you are considering filters such as the 590nm or 665nm. Scour prospective IR conversion companies’ websites to get a sense for their level of knowledge, insights, and options. Make a few phone calls and gauge the responsiveness of the companies’ product support staff. Don’t sign on for a conversion without making sure that all your questions are answered via phone or email. 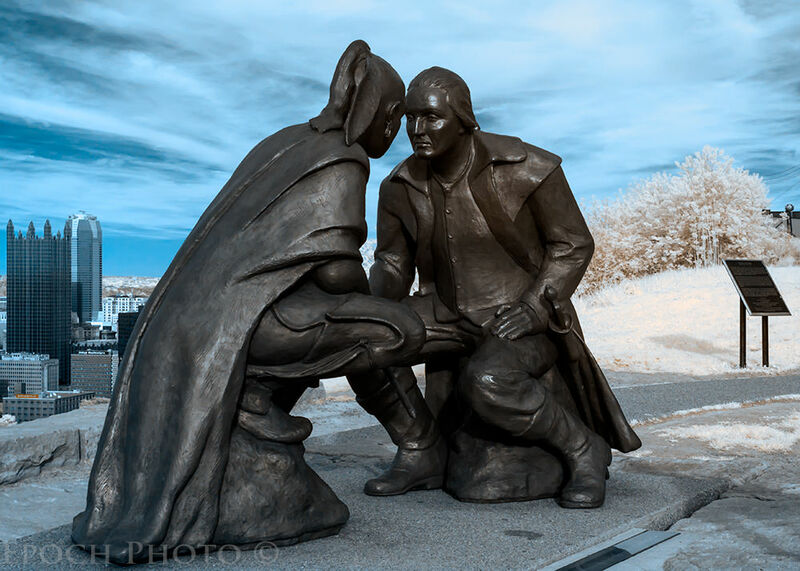 Since I wrote this article and others related to infrared photography, many people have emailed me with questions related to IR and advice regarding IR conversion services. Over the last few years, I have recommended Kolari Vision. Kolari Vision has converted four DSLRs for me. I have been very impressed with the quality of the service, turnaround time, value, and performance of the IR converted DSLRs. 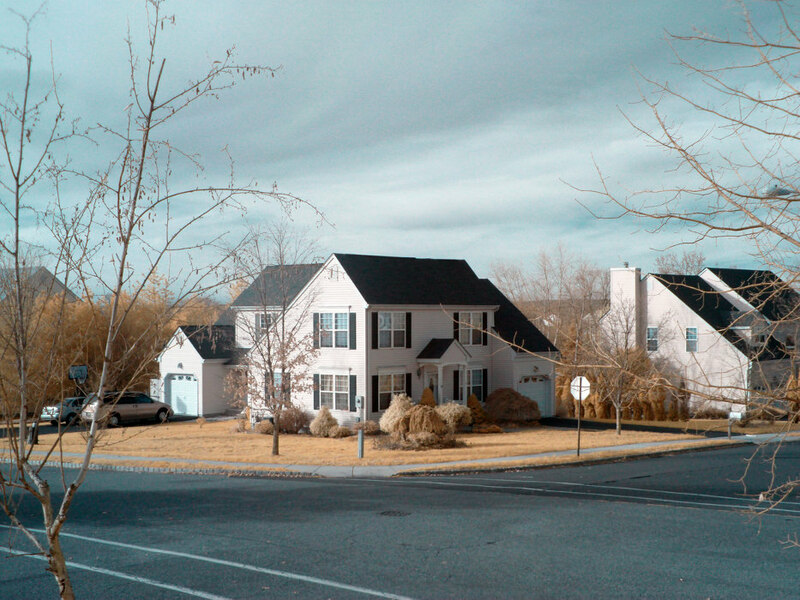 Ilija Melentijevic, Kolari Vision’s founder, has been especially patient and helpful in explaining the technical and nuanced aspects of converting and using digital cameras for infrared photography. Kolari Vision offers a full range of infrared, ultraviolet, and other specialized digital camera solutions and related filters. If you have any IR conversion stories to share, please post them below. Thanks Bob, that’s a very interesting and comprehensive review. I was discussing IR with some film enthusiasts and of course it cannot be purchased any more. The D70s was always reputed to be a good camera for IR conversion, but the film purists argued that it got nowhere near the IR B&W film. Have you experience of 35mm IR film when it was about Bob and if so do you think the D7100 is an equal rival, or just a different result? I haven’t had the opportunity to shoot IR film in my Nikon F100, but may someday get around to it. Keep in mind that you may never convince the purists of using new technology, however. Nice article but it would have been even more helpful if you had outlined which companies are best. You did that rersearch but you did not report your findings. It was not my intention to write a review of each IR conversion company in this article, but rather some of the issues with respect to filter/sensor combinations, and specifically the D7100’s suitability for IR. While I have done business with some IR companies, and am familiar with each of the others, it would be unfair of me to comment on those companies that I have not used as of yet. Years ago I tried IR photography of surgery and venous flow, etc. Quite amateurish. Haven’t seen anything quite like this. Very beautiful composures. Thanks for an interesting article. I have a D200 converted to IR and have been thinking about getting an updated body for IR use. The D7100 sounds appealing for that. My “go to” IR lens is the 18-70mm f/3.5-4.5G that Life Pixel recommends. Have you tried this for IR and how much better is the 16-85 you mention? There is lots of information out there about the best/worst lenses for IR. Also, have you noticed a difference between regular focusing and focusing using Live View? My D200 does not have Live View. Thanks. I’m glad that there are serious discussions about IR. Glad you liked the article. As you can see from my photos (hopefully! ), the D7100 is more than up to the task for IR photography. Regarding the 18-70mm lens, it gets good marks from some and mixed marks from others. I clearly saw some inconsistencies from my 18-70mm lens, despite the claims of some that it performs well. I would put it in the “mixed results” category. The 16-85mm lens, however, gets solid marks from every source I have found. I haven’t done much with Live View per se. Once you have converted your camera, it has been tuned for IR, and you have adjusted the lens via AF Fine Tuning, you should be able to capture very sharp images, since they remove the anti-aliasing filter as part of the conversion. Thanks for your reply. Thanks for sharing your experiences with IR photography and equipment. With the new technology available, my D200 is seeming pretty dated! Maybe a D7100 is in the future for me. nice article. I am also starting with IR photography. Waiting for my filter to arrive. I read this article photography.tutsplus.com/tutor…photo-9540 about using a DNG Profile Editor from Adobe Labs for changing the white balance properly in post. Since I havent gotten my filter yet, I havent tried it yet. I read your review with interest. Nice to see that the D7100 is conversion worthy. And also nice to hear about the Kolari conversion service. I will look into adding them to our recommended conversion shops. Inherent in the very longwave nature of IR is less surface detail and slightly less depth of field, both of which give a sense of softness in an IR image. This cannot be overcome. But is not as apparent in wide view landscape shots as it is in closer views. Using a Visible+Infrared filter with any lens not able to fully focus both wavelengths on the focus plane will further soften things. Thus, with kit lenses, it is probably best to choose an IR-pass filter past 700nm to eliminate yellow, orange and most of the red wavelengths. Because Nikon DSLRs do not completely white balance in-camera when IR converted, one must use a converter (or editor) capable of refining the white balance. Examples are Photo Ninja, View NX2 or Capture NX2 – all of which will do an excellent IR white balance on a raw Nikon IR photo. There are probably other such converter/editors too. Thanks so much for your insightful comments. I will indeed check out IR area on nikongear, as I am a lifetime member. My 720nm IR filters have produced much sharper images than the 665nm filter produced. I also have a 850nm filter on my D90. I need to do a comparison of the two cameras (D90/850nm and D7100/720nm) under some controlled conditions to negate the sensor size difference and see how much they differ. I tried Capture NX2 and didn’t find it to be any better than my combination of Lightroom and Photoshop. Although dealing with “pink” images in Lightroom is a bit aggravating, as long as you start with the right White Balance settings, and customize the Channel Mixer values for your specific camera/IR filter, you can get results that are just as good as Capture NX2. I haven’t seen much diffraction at f/8 but will try a controlled test to try when I have a chance. Thanks again! See you over on nikongear in the IR area as well! Hi, I just got a d7100 my question is, if the camera is ready for IR photos since it doesn’t come with lowpass filter sensor? Or if I have to do something else to make work? I have a polaroid filter IR720 but I’ve tried for many times and it doesn’t work. Any DSLR is capable of IR shots assuming you have it converted or use an external filter. The anti-aliasing filter simply blurs the image ever so slightly to avoid moire. There is no reason I can imagine why your polaroid 720nm filter shouldn’t work, as long as you set it for the appropriate exposure. External filters can requires 30-120 seconds depending on the specific DSLR, lens, and lighting conditions. Unfortunately, the conversion companies do not return the parts, so I do not have them to sell. You can contact Kolari Vision, however, and see if they might sell you some of the parts you are interested in purchasing. 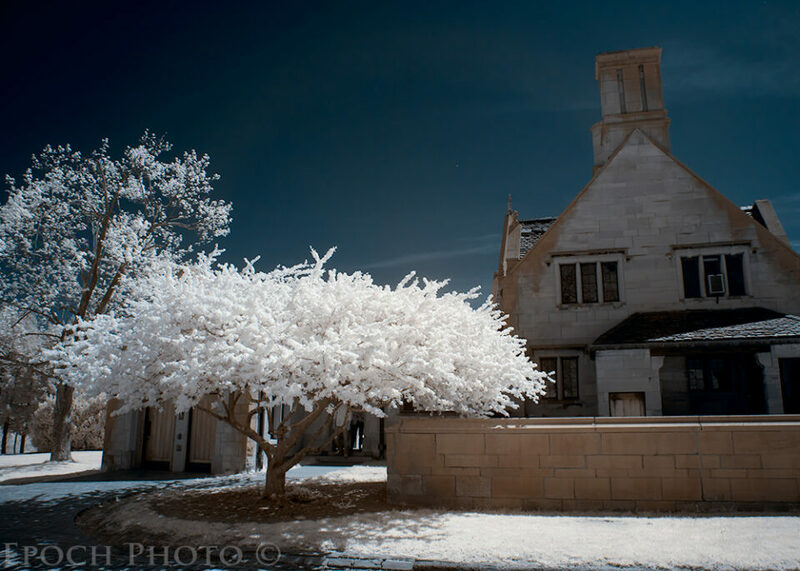 I have read this article and the Introduction to Infrared Photography, (3-12-2012) article, lots of great information. My question is why not convert the camera to full spectrum and use the appropriate IR filter to achieve the the images one desires. I spoke with Lifepixel and they suggest using a mirror-less camera such as a Panasonic Lumix G5 Mirrorless to convert . Would like to hear you thoughts on that. Hopefully you will have your eBook on IR photography out soon. Sorry for not getting back to you sooner. I also thought about this at one point. But by putting external filters, you won’t be able to focus like you would on a dedicated IR camera, since the external IR filter is nearly black. The exposure times will be short, but focusing challenges will be the same as using a normal DSLR with an external IR filter. The other thought is that Ultra-violet photos are not all that appealing. I have seen some that are interesting, but IMHO, they pale in comparison to IR photos. Really appreciate the article. Would welcome more content around your post processing experiments and methods if you do a follow up. I’m particularly intrigued by the green foliage interpretation and how to get both yellowish and white foliage in the same image. Thanks. 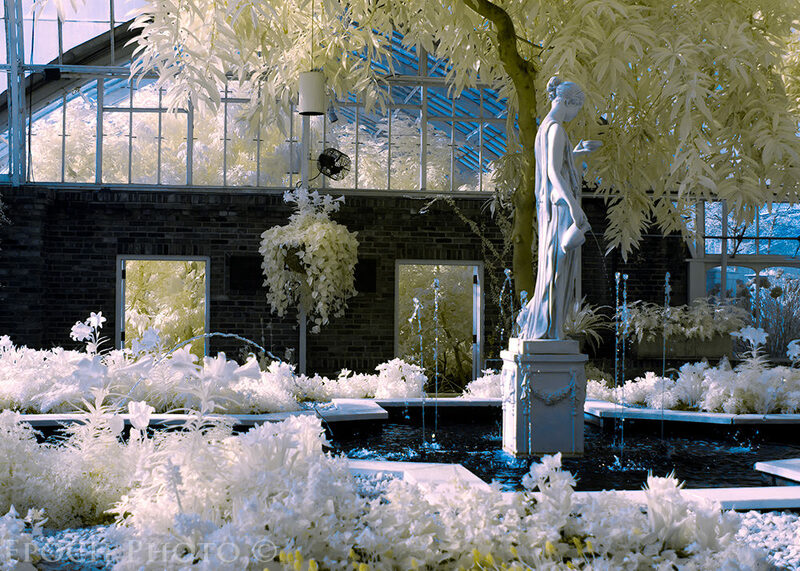 I plan to put out a few more IR articles this winter while visiting local conservatories. Great article and I really like the IR images on your website. I’m so glad I found it because I have also just had a d7100 converted (with a 710 filter). I got it back from a company here in Melbourne Australia and they had a massive problem trying to get a custom white balance. The technician said it was the first D7100 they had converted and the first Nikon camera conversion they they had struggled with in terms of white balance. Like you I tried the regular method of custom white balancing but with no success at all. You mentioned using an incandescent and halogen lamp? Can you provide a little more detail? Did you completely fill the frame with the bulb? Where you able to do on Aperture Priority mode or Manual? What type of Infrared Lamp did you use and of all the white balances which gives the best results? I would really appreciate any assistance you can provide. And is it at all possible to post an unprocessed raw image so that I can get a feel for what I should be looking for? I have the same problem with the White Balance in My Nikon D5300. It is impossible to set de WB PRE with the 720Nm filter. I did it one time with a 850Nm but never with 720 one. I have tried everything I can think of to set my Kolarivision 720nm converted D7100 custom white balance to green grass. No luck whatsoever. My 720nm D90 was a piece of cake. Even using a fast F/1.4 lens thinking that would help get more light through. Tried it using every procedure available. In live view no matter what I point the camera at I get the “Unable to measure white balance…” message, regardless of how dim or bright the sample area is. I was farting around in the office under FL’s and at one point I put the live view sample square on a very dim spot in the scene and tried it and got a “Data Acquired” message! Got me thinking that what is happening is that it needs very dim light, so I threw a pinhole on the D7100 I had made and went outside to the yard. I also took a 6 stop ND filter out with me. I put the ND filter over the pinhole and played around with different parts of the yard and my shadow on the yard, this is on a sunny day, and FINALLY got it to acquire the WB. Foliage isn’t EXACTLY neutral, it still has a very slight red tint to it, but it is very close and easy to correct in post. As a follow-up to this I switched the 720nm D7100 to a 720nm D800. The D800 had the same custom white balance issues, but I managed to get a custom white balance by using only the 6 stop ND and the polarizer on a 70-200mm F/2.8 (no pinhole) and pointed it at the lawn. I set the lens at F/4, the ISO at 100 and started at 1/8000, then just lowered the shutter speed a stop at a time until one clicked in as “good” I will play around with it more with different WB targets and see. Not alot of green here right now so waiting for trees to kick in to try against those. Thanks, Luis. I will have to try this. I tried more light/less light, but nothing was able to lock in an acceptable image that the camera could assign a white balance to. I will have to try your method. A handy tip if you’re having trouble setting a WB through any IR filter is: Take the photo properly exposed through the IR filter with auto WB set, then display it on your computer; then take the WB set photo of your computer screen without the IR filter attached displaying the part of the IR photo you want to use for your custom WB. This technique seems to give a more meaningful exposure and colour balance (to your sensor and processor) and is a pretty good starting point to help your RAW image record as wide a gamut as it can. Then you can more accurately set WB with the colour picker in post processing. Works a treat on an unconverted D800E with both 720nm, 760nm, 850nm and 950nm IR filters. FWIW I find 760nm better than a Hoya 720nm and the 850nm better still for false colour work, though greens are of course lightest with the 850nm. The 950nm gives almost no false colour and is essentially best for just greyscale images. …all on an unconverted D800E! Thanks to this article though I think I’ll get a D7100 and convert it for next summer. Thanks again! Thanks for the idea. I will have to give that a try. I have an 850nm IR converted D90, but was under the impression that false colors were just about impossible due to the small amount of visible light. I went back and tinkered with my white balance settings in Lightroom and found that I can indeed coax some false colors out of the 850mm. Thanks for bringing this to my attention. I didn’t understand your comment above, howerver, “”then take the WB set photo of your computer without the IR filter attached,” since my camera is now dedicated for IR. I think you will be happy with the D7100 as a dedicated IR camera. I can’t imagine needing anything more than this for IR. Thanks for the follow-up response. I thought this might involve two cameras, one being unconverted. The issue with Lightroom is that it is limited regarding what it will allow. As such, the images brought in always assume a strong pinkish tint. When I have set custom white balances in my infrared cameras, the image displayed looks markedly different than the one I see in Lightroom. I have found that using a gray card seems to work fine for creating a base image to work off of. I will take a crack at the technique you listed and let you know how it works. I have read your article today, 30 October 2014, and decided to change my order with Kolar Vision for converting D7100 from 665 to 720 nm IR filter!! I sent them an email advising my decision and hope Kolar Vision has not converted D7100 to 665 nm as per my original order!! Thank you for your great article on IR photography. Thanks for writing. Hope you caught it in time! Send along some links to your pictures when you have a chance. Yeah, I caught it in time and ….not!!! In time because they have not sent the ….converted camera into 665 nm IR back to me. So it cost me additional $$ to convert it back from 665 nm to 720 nm IR!!! But I don’t regret spending additional $$ because I would not like to confirm what you have already pointed out in your post about your experience with 665 nm IR filter on D7100. I will send a link once I have IR photos ready. Oh, money is very important but NOT everything in life! And you are right by saying that I will forget this small misadventure once I got the camera back from Kolar Vision. Could you please comment on what I found on my camera below? I think something is wrong but I don’t know. The only button which works is the focusing mode button! – When the camera switch button is placed in to OFF position all information does appear for a while on the top LCD screen just before the camera is switched off??!! – In Lv mode one can see ISO 1600 but it cannot be changed at all. You have some serious issues. Everything on my D7100 works fine. In particular, I use the exposure compensation button quite a bit, since the metering system can easily be fooled by infrared light and often needs to be adjusted. I would reach out personally to Ilija from KV to discuss. It cost me lots of money to convert D7100, as well as for postage to Australia (hundreds of $$) and the result is so awful that I cannot believe it. I contacted Ilija and am waiting for his reply. I could not have stumbled across your article at a better time! My Nikon D7100 is scheduled to arrive today! And I bought it for the purpose of having it converted to infrared. I’ve been shooting with an IR converted Nikon D200, 720nm, and like the results, but wanted more resolution as I make large prints, and wanted the Live View for more precise focusing. I HAD been planning on going with the 665nm filter, but after reading your article and seeing the images, I’ll stick with the 720nm filter! Thank you. I also have an external 820nm filter (Harrison and Harrison) that I’ve put over the lens of my converted D200 and it works very well for deeper infrared, so more options infrared wise. Though of course when I do this I compose and focus then switch focus to manual, prior to attaching the filter and shooting. Thank you again for your very informative article. I look forward to reading more of your work. Glad the article helped. As I wrote, the 665nm filter can produce some wonderful effects. 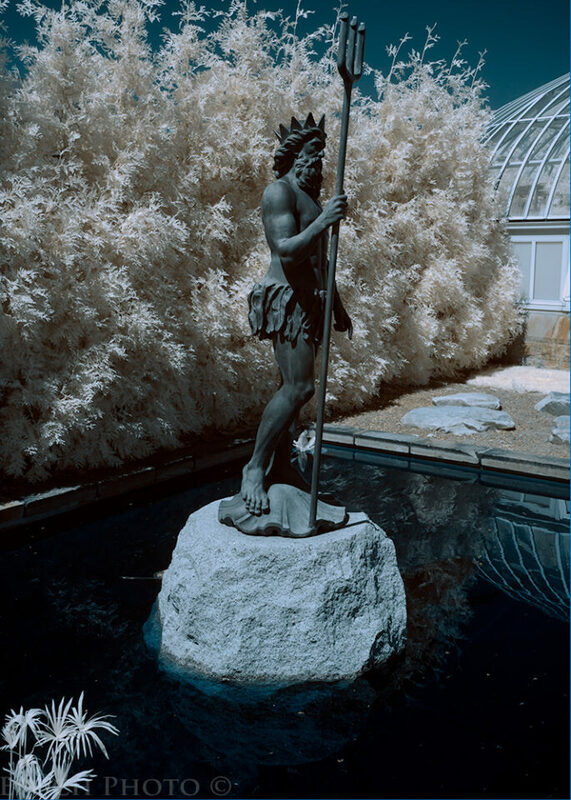 On balance, however, I found the 720nm filter to produce much better IR images across a variety of situations. Send a link to your pictures once you get the conversion done. I always appreciate seeing the work of others. Not quite sure what you mean by your question. An IR-converted camera will only take IR photos. You can use the techniques I discuss here and in the Introduction to IR article (photographylife.com/intro…hotography) to achieve what is called “false colors,” but you will only be capturing a small amount of visible light. A very helpful article, Bob. I am a M43 user and bought a Lumix G1 to covert to IR: I’ve just started to learn what it can do. I opted for a 665nm conversion, as I wasn’t too keen on the colours of the 590nm filter and am finding some of the same problems you did with the Nikon: less sharpness that I expected with any of my lenses, and difficulty extracting the false colours from very white foliage. My question is, if I add an external 720nm filter to the G1, will it improve the sharpness by taking out some of the wavelength mix? Thanks, Maggie. Sounds familiar. You can put a 720nm filter in front of your camera, but you will then not be able to focus due to the darkness of the IR filter. I tried this with my D7100. It worked, but I lost the ability to focus through the viewfinder. I suspect each camera/lens combination may focus slightly differently with respect to IR in general and then the specific IR wavelength as well. You may want to borrow an IR filter or even buy a cheap one to test it out. Ideally, you would be able to fine tune your G1 lens to compensate for IR light, but I don’t believe your camera has that capability. Hope this helps a bit. I find the world of IR photography fascinating. I own a Nikon D7000 which I’ve replaced in my kit with a D750 and also a D700. I was going to sell it but now am reconsidering. How suitable is the D7000 to an IR conversion? Thank you. I have had good luck with the following Nikon DSLRs on the infrared front: D40X, D90, D7100. I have seen many other photos taken with D50s, D70s, D700s, and D800s. I suspect the D7000 would be just fine for IR. Send along some pics when you have it done. Very helpful article and answers to comments. I’m thinking of getting my D5300 converted, which I believe shares the same sensor with the D7100. However the 16-85/3.5-5.6 concerns me, as I don’t rate mine very highly for colour work, giving rather “flat” results, lacking “clarity”. Do you think this lens is better (sharper and clearer) in IR than in colour…most are worse? Also do you find any focus drift with it at different Fls? Thank you. 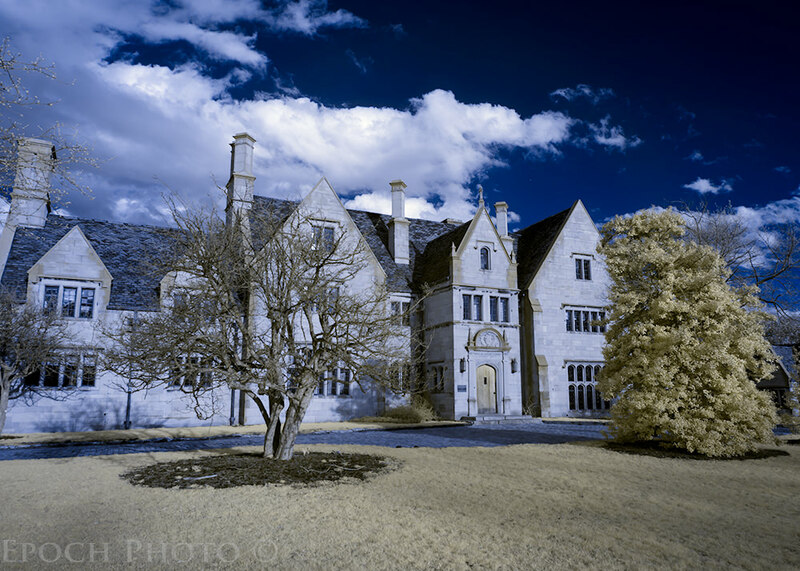 I have taken thousands of pictures with the 16-85mm on three different IR cameras. I think it one of the best IR lenses I have used. My photos have always been sharp at all focal lengths. If it has a weakness, I have never been able to find it. Do you always use AF with the 16-85? Do you find an optimum F stop for it? I occasionally use other lenses, but the 16-85mm suits most of my IR subjects just fine. I use f/5.6 or f/8. Occasionally, I will shoot at f/11. 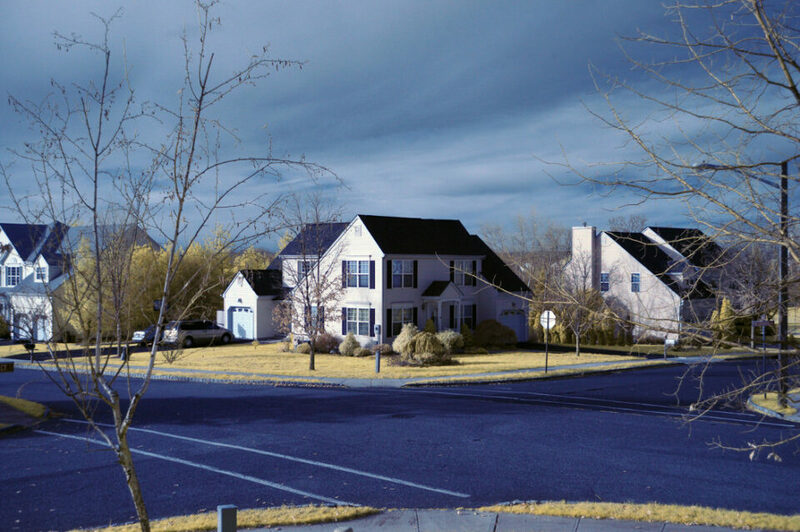 I read with interest about using bright light sources to set the white balance on the infrared converted D7100. I too had the same problem trying to set the white balance. I got a marginal white balance by using a white/blank screen on my laptop, but I’m frankly not satisfied and would like to do a more effective white balance. Which bright source did you find most effective in setting a white balance for infrared photography? I settled on a halogen lamp, believe it or not! for some reason, it provided a good white balance point with the D7100, whereas everything else I tried failed to do the trick. My LCD and my Custom Adobe Profile for my D7100 look identical relative to color. You put together a very informative article that I am sure helps many folks. Just as an FYI, I have a Nikon D610 converted to 590. It will not manual WB for infrared. I knew that going into the conversion but had talked to a photographer in France who used the same set up and he assured me I would be fine. He recommended Capture One Pro software which handles WB interpretation beautifully. PS, LR and ACR simply don’t have the range. I think Capture One is the best interpreter out there. What I do when shooting is set the camera to preview in b/w so I can at least see an image that isn’t all red. Yes, it’s b/w and I’m shooting color but it’s a decent reference. Then in Capture One it’s a simple click of the eyedropper to set WB. Voila. While this approach works, I still would prefer having WB in the field. So, for those having issues with WB, Capture One can be a solution to the problem. I found your article while searching for information about converting a D7000. A friend of mine is considering it. Your article on the 7100 is the closest I’ve found. Do you know anything about the effectiveness of the D7000? I found that I had a difficult time setting a custom white balance with the D7100, following the traditional means (metering off grass or other vegetation). I found that focusing on a halogen lamp allowed me to create a custom white balance, however. I don’t have any experiences with the D7000, but have seen many photos on the net from people that had them converted. The other thing I found is the custom white balance is not as critical as I originally thought. 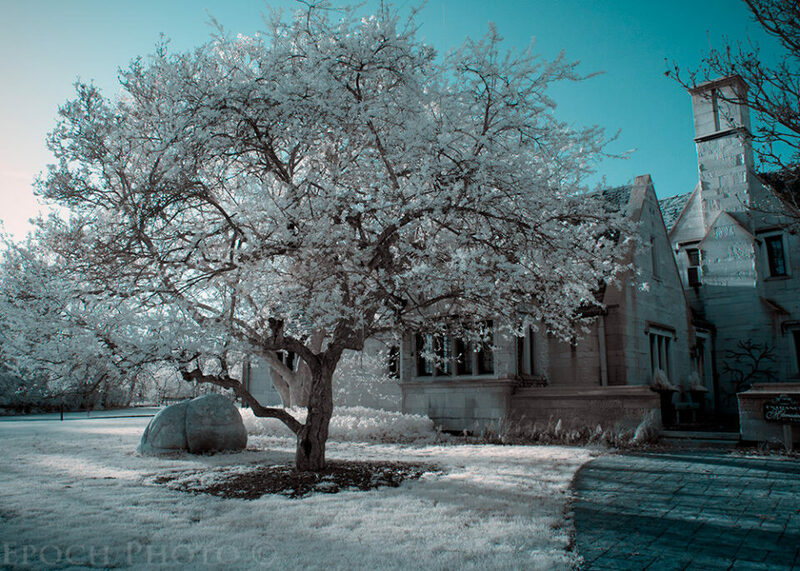 There are many ways to get a good looking IR photo, many of which are associated with using custom levels or color mixer settings in Photoshop. Thanks for the tip on the Capture One Pro software. I may get around to trying it, as I am always interested in tools that can facilitate the IR workflow. Accurate WB isn’t essential but it helps record as wide a gamut as possible, which can help softer and gentler whites, and help retrieve data for smoother blue skies in PP (for example). have quite some experience now with IR photography… I’m always suprised that people consider the 18-55 mm lens “excellent” for IR. I have the lens but don’t think it’s great. The 50mm 1.8 is far superior… I use the Nikon D70 and now the Nikon D3200… what do youn think? and do you have suggestions for other fine IR DX lenses? I and others have had very good experiences with the 18-55mm. I like the zooms since they offer more versatility. Nasim has IR ratings on most of the lenses on PL. There are also many other sites you can find that list the suitability for most lenses for IR. Newer lenses are a bit tougher to get a handle on, however, since IR is still a pretty narrow niche. If I had to pick a few lenses for an Nikon IR system, relative to versatility and performance, I would pick the 16-85mm every time. This one lens will suffice for most IR shots. Next would be the 10-24mm for wide angle IR shots. After that, the 70-200mm f/4 would round out the list. If the 16-85mm is out of your budget, the 18-55mm would be a good substitute. The 35mm f/1.8 DX is also a good lens if you want a narrow depth of field. Great article thanks. Good to see it is still active 3 years later. Wish I read it 6 months ago before converting my old D200 to Full Spectrum. I chose to convert the D200 as (apparently) ccd is better for UV. However, focussing witout live view or calibration is difficult, as can be expected. I am spoiled by my Panasonic G5 Mirrorless conversion. Thank you. My first choice would be the D7200. It handles noise better and, since you are going to have it modified (and thus negate the warranty), buying a gray market or refurbished copy for ~$750 makes good sense. I also have to say that a Sony 6000 is not a bad choice either. If you choose Kolari Vision’s Two Spectrum Conversion, you can use various IR filters on the front of lens which will give you 590nm, 665nm, 720nm, and 850nm – all in one camera, because you can still focus through the viewfinder. Yes, you will have to buy separate IR filters, but this configuration provides more flexibility for IR shooting than a traditional IR-converted DSLR. This is one advantage mirrorless models have over their DSLR equivalents. I can convert a Nikon D7200 to 590nm, and the put other IR filters on my lenses, but I won’t be able to focus using my viewfinder, since the IR filter on the lens will eliminate visible light. Great article Bob! Recently purchased a 665 nm converted d3300 from Digital Landscapes and have taken several IR shots with great satisfaction. Based on this and IIija’s suggestion I went with a converted d7100 as I desire a Nikon with better control, I ordered a 665 nm converted d7100 from Kolari Vision. Nikon has a WB preset feature where I can copy WB from an existing picture so I’m hoping to a use a good WB image on my SD from the d3300 to create a WB preset on the d7100. Thanks, Alan. I almost went with one of the entry level Nikons, but the lack of easy access to the exposure compensation button was a good reason to stick with the D7X00 series. Despite my criticism of the mirrorless platforms, their EVFs are a real boon to anyone shooting IR, since they can use one IR-converted camera with multiple IR filters. If there was a single reason to go mirrorless, this would be it. Send some links to your photos when you have a chance. Nice article, Bob. I recently had a D7200 converted but I’ve run into a problem – I can’t get a custom WB no matter how hard I try. It’s been easy on 3 other Nikons I’ve had, but Maxmax told me there’s a firmware limit for WB on this camera. They claim a WB can still be done by slowly increasing exposure but it hasn’t worked for me. I’m grasping at straws but wondered if I obtained a single NEF (from a similar 24 mp Nikon) which uses an IR custom WB, if I could copy it to a memory card and have the camera read the WB. Being a 7100 your NEF’s may not be accepted by my 7200, but I’d love to try this if you wouldn’t mind donating a NEF. Dan, if you send me your email address, I can send you a NEF RAW file taken of an 18% grey card from my 665 nm converted D3300 which had been successfully white balanced as part of it’s conversion. I’m going to try the file on 665 converted D7100 once it arrive from Kolari Vision. If it works, let me know. Thanks. I would suggest pointing your D7200 at a halogen lamp and see if that will do the trick. This worked for me. If it doesn’t, I would be glad to send you a file. Thanks, Alan. I’ll give it a shot. My IR is a 720 nm filter and I usually shoot green grass, but if my 7200 can copy your WB I’d certainly think I’d get much more in the ballpark of proper WB than anything I can currently achieve. Send to [email protected] Thank you! Bob, in your discussions with Ilija, he agreed a 720 conversion would be best for your D7100 because the whites from foliage was dull with the 665 filter installed from another vender. Since you mentioned that filter characteristics vary with manufacturer, did he mention that his 665 could have been better on foliage or was it because the 720 exchange would definitely give you the whites you desired? I only ask because his Kolari Vision website, he finds the 665 to be the most useful IR filter. I assume it’s because post-process 720 whites can be mimicked (at least with his 665 filter). I considered the fact that different IR conversion companies use different IR filters, and there was an opportunity that Kolari Vision’s 665nm IR filter might yield different results than the one I received from LifePixel. In the end, I chose a 720nm for all the reasons stated here and elsewhere. The issue for IR filters is that there are no standards by which to compare one IR filter brand to another. I have no doubt Ilija has the experience to back up his claim. Perhaps someday in the future, I will try a 665nm filter from KV. Alan – thanks, but my camera wouldn’t read your file. Bob, after your suggestion I tried using a headlight on my new truck. It worked! The custom WB is miles ahead of where I was, though not perfect. I would still be interested in one of your image files to copy the WB from. Then I could see which is better. My email is in post 31 above, but something like a Dropbox public folder or a Mac Mail Drop might handle the large NEF file better than email. Thanks for your assistance! Wadda ya know? :) Glad it worked. I pull my files into Lightroom, where I installed a utility that extends Lightroom’s WB beyond the usual limits (I forget what it is called, but will find out). This gives me a solid foundation from which to start my IR processing. I will get a few images to you in a Dropbox folder and shoot you an email in the next few days. Does this help? I suspect having the file is not going to do anything more for you. As you can see, Robert’s profile is very close to my own. The same WB article I sent Dan. It’s a great reference to set up WB for IR photography. Thanks Bob for the kind remark about my article and for sharing it here! Highly appreciated! 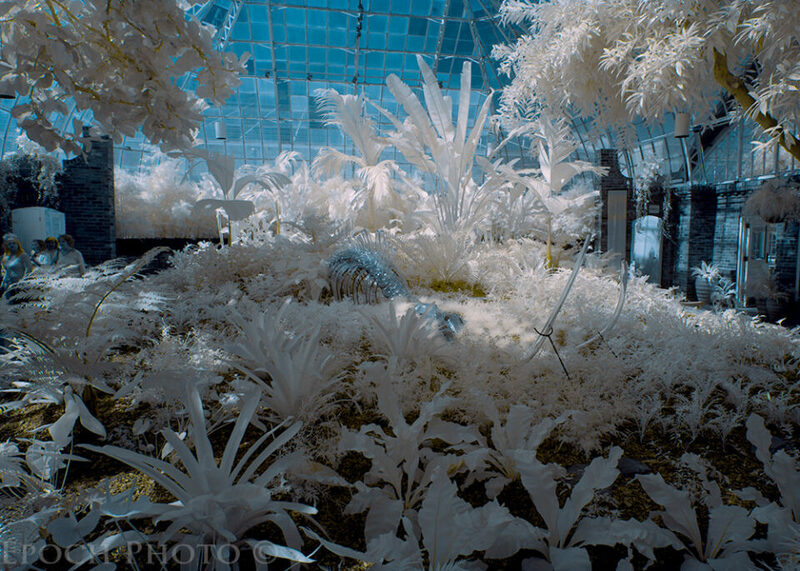 Capture One Pro does an excellent job of White Balancing infrared shots that were not WBed in camera. I have a Nikon D610 converted to 590nm and it will not WB in camera. (My previous converted camera the D300 would WB) I load the RAW files into Capture One Pro and do a manual WB there and also do some tweaks to the RAW files for exposure, contrast, etc, and then output TIFFs to take into PS for further work. For anything not requiring Photoshop, I use Capture One Pro 9. On most any IR image I have, one click of the eyedropper and WB is perfect. I can also save that camera’s custom WB and and then apply it to all selected images in one click. (I also put in a feature request today to Phase One to allow me to make a custom WB the default for a specific camera since many other adjustments can be so treated). So post processing is not my issue. My issue has always been to get as true a WB as possible *into the camera* so I can better judge proper exposure on the camera’s RGB histogram and get a useful visual when chimping on the camera’s rear LCD. Without the camera having a custom WB it’s much more difficult to tell if my exposure and composition are on because the red histogram is blown out and the LCD image is fairly low contrast & an irksome pink. I briefly used Lightroom 4 but disliked it’s modal operation, so while I appreciate the linked article, it’s obviously most relevant to Camera Raw/Lightroom users. I have also decided against using DNG files. The temperature and tint numbers are on different scales for Lightroom and Capture One, so my numbers won’t line up with yours. But after finally getting a custom WB (thanks Bob! ), my “as shot” WB reads a temp/tint of 3193 & -64.2 in C1. Then one eye-dropper click later, C1 fine tunes the WB which is often in the 2600/-68 vicinity. My only thought after actually achieving the custom WB was to see if I could narrow the (admittedly smallish) difference between the “as shot” WB and the final WB. But I’m going to be fine with the WB I have. Now my only remaining issue to try to improve the autofocus accuracy of the camera. Maxmax put focus in the ballpark, but it degrades too much away from center to suit me on my wide angle shots. I understand that wide angle lenses are problematic in IR due to the difference in wavelength in IR and “normal” color work, but I have an old converted D200 that is pretty darn sharp across the frame with the *same lens* at the equivilent of 24mm. I’d think I could get similar focus accuracy on the D7200 since it is an APS-C sensor also. Clicking on that link just took me to a sign-in and then to my own Dropbox page. I found nothing pointing to your files. Sorry, I’m new to Dropbox. I thought I had it set where anyone can view it on my timeline. However, I added your email to the list of who can view it so at least you can see it. If my images are not viewable with the supplied link, anyone more familiar with Dropbox with advice on enabling viewing would be appreciated. If I need to upgrade from basic to the paid service, it’s not worth it for me and I’ll go a different route. I just got my D7100 converted to 665 from Kolari Vision and have the following observation on creating a custom WB preset. As reported by Bob and others, you’re starting point is by aiming the camera at a bright halogen source and plug away on continuously shooting in the pre-measurement mode with different exposures or positions in the frame until you finally get a “good” reading. Be patient, It may take many attempts before the camera gets one. I used a halogen headlight as my source. Now that you have a “good” reading, it’s still far from perfect, so use the WB fine tuning feature to slightly neutralize the cast and then protect just it to be safe. As Dan mentioned, images taken with this custom WB preset are far better than the strong pink cast on Auto WB. Next make fine tuning color adjustments, save this custom preset and make a new image with your converted camera with the camera using previously fine tuned preset and place this new image in the next destination (d-2 in my case). Then simply modify the image with the fine tuning feature and retake another image to see if addition changes are needed. Keep repeating until you finally get a custom WB preset that generates as little a cast as possible, making certain of course the exposure compensation is always adjusted where the histogram hump is centered in the X axis. It may not be grey but reasonably close depending in you patience. Once done, you cane further fine tune in your post process presets for a truely neutral WB. Further experimentation on WB’ng my 665 converted D7100 revealed that simply attaching a Hoya R72 filter on my lens and shooting at a 50K halogen spotlight gave a “good” reading on my very first attempt in the measured WB preset mode! Using this preset, shooting a grey card gives an image that can be uploaded for the purpose of creating a new DNG profile in LR using the WB calibration slider to get a perfectly neutral grey without the need of further tweaking in the LR default settings. It is far more neutral than the previous method I described. I got the idea after speaking to Ilija who explained that the IR converted D7000 series does very poorly with measured WB’ng on a 665 conversion but very not badly on a 590 or 720 conversion. By placing a 720 nm filter in front of the lens, it eliminates any visible light that confuses the 665 converted camera. Apparently the visible light in the 665 spectrum is enough to keep the measured WB feature from working correctly. Conversely, the 590 allows enough visible light to work and the 720 is monochromatic IR so as not to confuse the camera. Since this was done at night, I’ll see what kind of results I get shooting in daylight. I used a 50W halogen spotlight, not 50K. Sorry for the typo. Further experimentation on WB’ng my 665 converted D7100 revealed that simply attaching a Hoya R72 filter on my lens and shooting at a 50W halogen spotlight gave a “good” reading on my very first attempt in the measured WB preset mode! Using this preset, shooting a grey card gives an image that can be uploaded for the purpose of creating a new DNG profile in LR using the WB calibration slider to get a perfectly neutral grey without the need of further tweaking in the LR default settings. It is far more neutral than the previous method I described. I got the idea after speaking to Ilija who explained that the IR converted D7000 series does very poorly with measured WB’ng on a 665 conversion but very not badly on a 590 or 720 conversion. By placing a 720 nm filter in front of the lens, it eliminates any visible light that confuses the 665 converted camera. Apparently the visible light in the 665 spectrum is enough to keep the measured WB feature from working correctly. Conversely, the 590 allows enough visible light to work and the 720 is monochromatic IR so as not to confuse the camera. Since this was done at night, I’ll see what kind of results I get shooting in daylight. Further experimentation finds a Hoya R25A over the lens also gives an effortless measured preset with a 50W halogen spotlight aimed at the camera. This I thing is the best way since the filter allows about 620 nm and longer to get to the sensor giving a more realistic WB. Apparently shorter visible light fouls up the measured WB mode on the D7000 series. Adding blue and or green to a picture taken with this preset in the fine tuning mode and then taking another image with the new fine tuned preset gives an image that can be saved as another WB preset and should be easier to use in calibrating for neutral on the DNG profile download. This assumes the camera’s red, green and blue histograms are closer in line with each other on shooting a uniformly lit white card filling the frame. The red will still be brighter but hopefully WB fine tuning mitigates this a bit. Additional experimentation finds a simple Hoya R25A over the lens also gives an effortless measured preset using a 50W halogen spotlight aimed at the camera. I think it’s the best way so far since that filter allows about 620 nm and longer to get to the sensor giving a more realistic WB than a 720 nm IR filter over the lens. Apparently short visible light fouls up the measured WB mode on the 665 converted D7000 series. Adding blue and or green to a picture taken with this preset in the fine tuning mode and then taking another image with the new fine tuned preset gives an image that can be saved as another WB preset and should be easier to use in calibrating for neutral on the DNG profile download. The goal being to have the red, green and blue histograms closer in line with each other on shooting a uniformly lit white card filling the frame. The red may still be brighter but hopefully WB fine tuning mitigates this a bit. Regarding the perceived sharpness reduction with a 665 nm conversion (compared to 720 nm conversion), it’s best to send your preferred lens(s) to the conversion service for optimal AF calibration. User AF fine tuning (when provided) may not be broad enough to cover the needed AF compensation of a given lens for optimal sharpness. For example, I found that even with AF fine tuning set to +20 on my 665nm Nikon D7100, much more plus was actually needed for my 12-24/4 AFS to be tack sharp. Resetting the camera’s AF outside the fine tuning range can be easily performed by a competent conversion service. There is no doubt that a filter’s frequency affects focus on the sensor and some lenses are more sensitive than others with this issue. Just sent an enquirey off to a UK IR conversion service about the D7100 and an 18-55 kit lens. Looks like this could be a good choice. I got a d7100 full spectrum too! You’re not the only one. It’s So much fun! I was having some difficulty acquiring a custom white balance with various ir filters on. I managed to get a reading on the 830nm which rendered the images black and white, as to be expected. The same white balance setting works with the other filters i have, 720nm, 650nm and 590nm, but the camera will not take a reading for a custom white balance with those three. Have you noticed any similar issues? Is it necessary to do a custom white balance for each individual filter, or is the one calibration with the 830nm filter sufficient to use for the other three? I’d appreciate any advice on how to successfully acquire a custom white balance with the d7100 with ir filters in place. Corey, have a look at my comment number 17 for my work-around when having difficulty setting WB through IR filters. You should, though, find the 850 close enough with a bit of fine tuning in post. I’m nowhere near as experienced at IR as Bob though! I’d be interested to know if my workaround works for you. I don’t have a full spectrum conversion, but you must perform a white balance calibration for each IR filter you use, as the light from one frequency is different than that of another. I’ve tried using my camera profiles from one IR camera on the photos taken by another and gotten bizarre unusable results. As I’ve stated elsewhere, pointing your DSLR at a halogen light seems to work in some situations. Give that a shot and let me know if it works. White balance is likely the most frustrating issue for most people in the IR world, particularly beginners. See my comments from 41 through 42.1.2 on my WB technique on my D7100 IR. Bob, Alan… Isn’t half the point (the other half being other results) of WBing to get white, or at least near white, foliage? Surely that doesn’t work by pointing at a white light source; what kind of output does it work well for? I’m genuinely interested, as you say WB in IR could have a whole chapter to itself! Right you are. However, the issue is that some cameras, upon conversion, have a very difficult time creating a WB setting by pointing them at a patch of grass. This was certainly the case with the D7100, and probably the case for other cameras as well. For whatever reason, pointing the D7100 at a halogen light did indeed enable me to create a WB setting that worked perfectly. My D40X, D90, and D7200 IR converted DSLRs did not have this problem. I could point these cameras at my front lawn and get an accurate WB setting. Remember, DSLRs are not engineered to optimize their use with IR light. Thus, some may behave better (or worse) with IR light than others. With my 665 nm converted D7100, it was impossible to get a truely neutral WB, i.e. gray looks gray. You can only get it somewhat close and the rest you fix in post processing like LR. Yes. Using a camera profile using Adobe’s Profiler tool helps quite a bit as well. Even then, you will also find that each lens requires its own WB settings. My Nikon 16-85mm has a different WB than that of my Tamron 150-600mm G2. If I confuse the two, the photos will skew toward the yellow or blue temperatures. Thank you for the information! I’ll give it a try. I was wondering what you thought about using an x-rite colour checker with each filter to create dng profiles for lightroom, would this be a good way to get a white balance reading with the filter in place? After setting a WB in camera (patch of grass or halogen light, in the case of the D7100 which struggled with the normal WB process), I export a DNG copy of my NEF file. I then follow the instructions here (www.youtube.com/watch…e8If0LXWQ0) to create a camera profile in Lightroom. After that, I create a LR profile tweaking various sliders so that when I pull the file into Photoshop, I can run an action that swaps the colors and makes some adjustments to colors, contrast, etc. Admittedly, it takes some time and patience to create some LR presets to cover the broad range of light you may encounter and lenses you use, but it is well worth it.